Very good music & visuals. 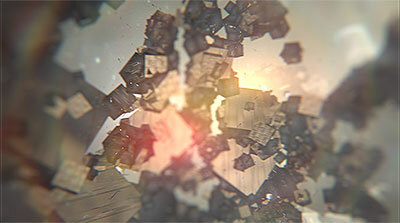 Strange and appealing shaded materials, yummy textures, and nicely done "viewport" cuts. Pure eye candy! I love it! Tuneage is nice and fits well with the other Rainbow Clash tracks but somehow the mix is annoying. It could use some reengineering, then it'd be really cool. One of best moments from compo, pleasant show to watch. I like SlySpy´s demos and design. I really like the previous installments; this however left me cold. It starts with the track which is a bit... unengaging maybe?, and ends with the visuals where there isn't as much to spot and see as in earlier productions. This is the winner for me. My God, this music is absolutely amazing!!! Thank you. What Optima said. Luv' those crystals! Come on Revision ppl, what's wrong with you? 9th place. I mean ninth-fu**in'-place? Either the formula is wearing thin, or it requires cranking up a notch or two in the psychedelica department. Regardless, this one didn't work as well for me as the previous UF&DD demos. i still dont like how these uf+dd work visually and even musically, but i must say that these demos are one of the most advanced DEMOS in a real sense of the idea that code, performance and optimisation is just awesome - the archive is just around 10MB and unlike many others 2017 demos this work flawlesly and doesn't stutter on my system even in 1080p - just as i'd expect any serious demo to work at least on par with the games this same system runs. so, although not artistically fascinated (yet), thumb up for the true demoscene performance-wise coding. i think we need more quality optimized code on demoscene, and this sure is a fine example. I think this is my favourite of the Rainbow Clash series. page created in 0.017453 seconds with 15 queries.